Looking in dictionaries, I have found that the modern Swedish word "tagel" has the same root as the English word "tail". Hereby we can conclude that "horsehair" is the tail of the horse. When I say "horsehair", the tail and mane of a horse as well as the "tuft" at the end of a cow's tail are sources that I think of. There probably are other animals that have the same type of slick, stiffish hair, but horses' tails are the only ones to have fibers long enough to weave with without spinning. Being hair, it is a protein fibre, so it has more or less the same properties as other protein fibres. Being harder and stiffer means it takes longer to absorb water, and it takes considerably more work to felt (but it does). It can be dyed with dyes suitable for protein fibres. In Scandinavia, peasants and fishermen have mostly used it spun for ropes, for fishing lines (possibly plaited), for milk sieves, fishing mittens, outer socks, horse reins and horse rugs. Unspun it has been used for flour sieves and brushes. Upholstery fabrics with horsehair as weft has primarily been used by the wealthier classes, and (I guess) the same went for "stiffening fabrics" as in men's coats and crinolines, (which happens to mean "horsehair and linen"). What is horsehair used for today? Brushes and stuffing are the most common uses today. Upholstery fabric is woven industrially in France and Great Britain. I recently held a workshop at a school in Sweden which is into the old ways and do-it-yourself. At this school they really start from the beginning - the first year starts with shearing, building spindles, spinning, building warp-weighted looms, going on to making their own rigid heddle looms for band-weaving. They have some, but not that much, weaving on conventional floor looms, too. I taught the second-year textile class to weave horsehair sieve-fabric, then they get to do the woodwork and the mounting with the help of the woodwork teacher. The frames are made of pine or sallow (a type of willow also known as goat willow). As most horses have black tails, most sieves I have seen are black, though some are checked or plaid. 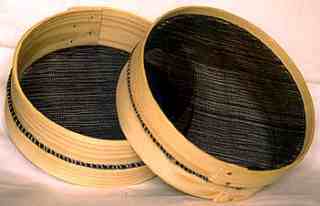 Unlike upholstery, where the horsehair is used only as weft, both the warp and weft of sieve fabric is horsehair. I have an old price list from a sievemaking company, they listed hair sieves in at least 5 "densities" - for sifting flour, straining, and so on. I have seen something that the museum catalog called "sieve", but which had a very, very, very close sett and had nail holes at all four sides. Nothing would have come through this weave, and the holes (to me) suggest "chair". In 1994 I was asked to weave horsehair fabric for 21 chairs in Skansen, the open-air museum in Stockholm. I accepted the challenge, but I had really no idea as to how do it efficiently. I also got curious about horsehair fabric as a topic: when was it fashionable, how did the old fabrics look, what kind of weaves were used, etc., etc. I went to the library, but how does one search? Horsehair, furniture history - all words I could think of yielded nothing. Here and there horsehair was mentioned, but always without details. The only book I found with information about how to handle horsehair for weaving was a French textile encyclopedia from 1859 ("Dictionnaire general des tissus anciens et modernes", tome I, Lyon 1859). Then I went to the museums. Searching them was almost as hard: most furniture is catalogued by style and/or by wood type. Most museums were not willing to let me into their magazines, but in a few places I found a "mahogany Empire-style chair" or a "mid- 19th century dining room chair" with horsehair fabric. All in all I have managed to see maybe 50 old upholstery fabrics with horsehair as weft. Most of these are very hard to date with a reasonable security, but the oldest was probably from early 19th century. Generally it can be said that: horsehair fabrics have a relatively coarse warp of cotton, maybe 2/12, and the warp has a relatively open sett, maybe 11 ends per cm (27- 28 epi); unpatterned horsehair fabrics has a satin structure and about 60 picks per cm; striped horsehair fabrics are either weft twill with a herringbone treadling, or have stripes of satin or weft dominant broken twill alternating with stripes of weft rep and have about 40-50 picks per cm; patterned horsehair fabrics are woven in Bronson lace, often with multiple blocks and very long floats. All patterned horsehair fabrics I have seen are in this weave, most with one fibre per pick, some with two fibres per pattern pick, one fibre per tabby pick. As I had to weave a 16-meter warp. I just had to figure out some efficient methods of handling the horsehair. First, I needed a container of some sort - after a few tries I settled for a piece of plastic sewer pipe. One extra plus with them is, there are plugs available that fit, and fit tight! This I tied to the loom, and "stood" a horse-tail in it, "horse-end" down. If the pipe is about as long as the weave is wide, this means all fibres long enough to reach the whole width protrude over the top of the pipe, while all shorter fibres stay nicely organized inside, ready to collect and tie for safekeeping (or for a narrower weave, or for spinning, or whatever). Next, I needed something to use as a shuttle. Obviously, a normal shuttle was not the best tool. I tried using a pick-up stick with double- sided sticky tape, but decided I wanted something more shuttle-like. I started thinking "clothes-pin", but all kinds of clips I could find had far too hard springs. I did not want to end up with a strained thumb! In the end I built a horsehair shuttle from an old open-bottomed shuttle: sawed through in one end, it had a nice easy spring to it, and completed with a couple of bent key-rings and some soft rubber pads it holds the fibre in a light grip. And I was ready to weave! I found it very difficult to beat as hard as required. The fibres were too stiff to do the "over and under"-thing easily, no matter what tension I had on the warp. I also found that the fibers break easily if the weft is bubbled, and that I had to figure out a way to handle the selveges. A year later, I found one way of making the beating easier. To avoid bubbling the weft was no problem - and for the selvedges, I tried two methods. One was to hemstitch the sides as I wove, but what I finally decided to do was to make a fibre turn around the edge thread(s), go back in the shed a cm or so, and then go out on the reverse side. Beat first in an open shed, beat again after changing sheds. Turn the fibres so that root and tip end alternates. Use a helper (actually, the book says "use a child") to deliver one fibre at a time. Use a relatively open sett (otherwise the fibres break easily). Make sure root and tip ends alternate. Have patience - I can weave maybe 7-8 cms per hour. 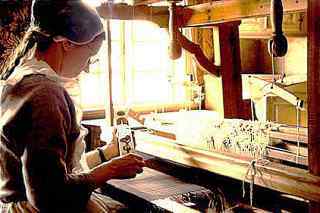 Kerstin has been a spinner and a weaver since 1980. She learned to spin horsehair in Iceland 1987 and has been seriously weaving with horsehair since 1992. She has taught classes in horsehair spinning and weaving in various parts of Sweden and has exhibited her work in Sweden and at Convergence '94, Cloth*ing '96, Convergence '96 and '98. She has had articles published in Hemslöjden (1988) and Spin Off (1993). She was a teacher at the 1999 ANWG conference, SETT Under the Big Sky, in Bozeman, Montana. Kerstin would love to hear from anyone having information on horsehair traditions in the Americas. Copyright © 1998 by Kerstin Fröberg. Please contact the author for permission to use any part of this article. Kerstin at work (and play).